Smooth, creamy and loaded with all the flavors of spiced curry, your whole family will love this Healthy Curry Lentil Soup with Coconut Milk. 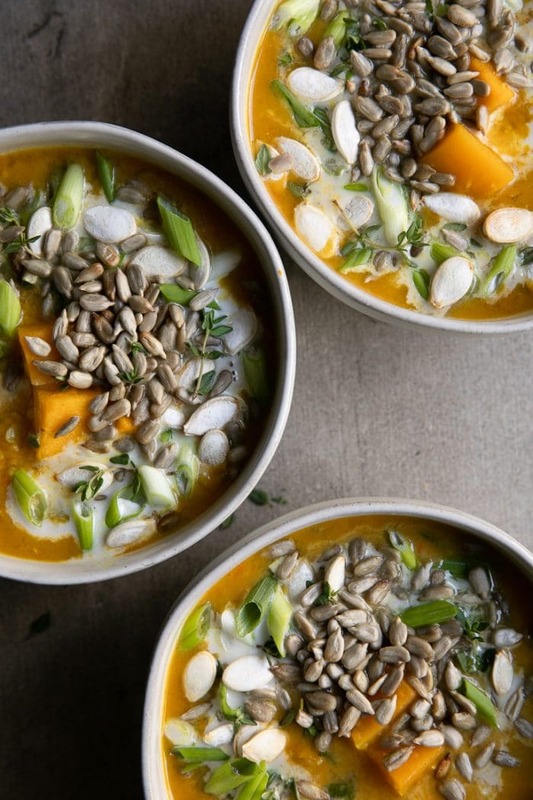 Made with pumpkin, butternut squash, mixed vegetables, and topped with all your favorite garnishes, it’s easy to enjoy this lentil soup all winter long! The time of year has arrived for all things warm and cozy. Things like this Instant Pot Beef Stew, cups of homemade Bone Broth, and, of course, this easy and delicious Curry Lentil Soup with coconut milk. 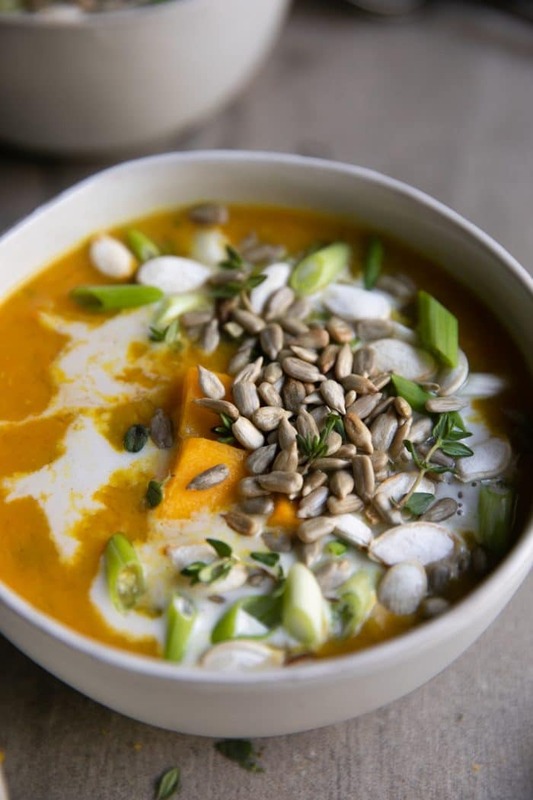 And whether you are a vegetarian or full-blown meat eating carnivore, you’ll quickly fall in love with this curry-spiced and squash-filled lentil soup. 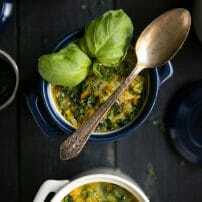 Easy to prepare, this soup tastes best when the lentils are given at least 90 minutes to simmer, tenderize, and thicken. In fact, I am a firm believer that all lentil soups taste better leftover the next day. I am a firm believer that full-fat coconut milk is best. 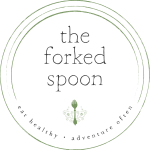 Reduced fat, while lower in calories and overall fat content is ok, the flavor is nowhere close to that of real full-fat coconut milk or cream. As a result, I would always find myself substituting with extra salt or over-garnishing. Of course, use whatever works best for you and your family. Aside from the awesome flavor of this lentil soup is how easy it is to make. The hardest part to the whole recipe is chopping, stirring, and busting out your blender if you prefer a smooth and creamy soup versus a chunky one. 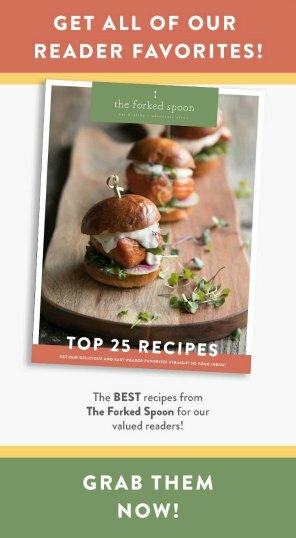 In other words, this recipe isn’t hard at all. First, cook the vegetables. Grab a large pot or Dutch oven and set it over medium heat. Add the olive oil and onion and cook for 3-4 minutes, stirring often. Add the carrots and celery and continue cooking for an additional 5 minutes with yes, more stirring. Finally, add the butternut squash, garlic, and apple to the pot, mixing well to combine. Cook over medium heat, stirring often, for 5-7 minutes, or until butternut squash just starts to turn tender. Try not to burn the vegetables. Add the water (or vegetable broth) to the pot. Increase heat to high and just long enough to bring vegetables and broth to a boil. Cover, reduce heat to low and simmer for 5 minutes. The vegetables have been slowly cooked, the broth is boiled, now it is time to add the pumpkin puree, spices, and lentils. 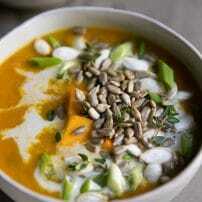 Use a whisk to fully incorporate the pumpkin and the spices in with the vegetables and lentils. If the soup is no longer boiling, return to a boil before immediately reducing heat to low and covering with a tight-fitting lid. Simmer for 45-60 minutes, stirring every 5-10 minutes. Add the coconut milk. After the lentils have started to cook and thicken, add the coconut milk to the pot. Stir well to combine and continue to cook, covered, over low heat for an additional 30 minutes, or until the lentils are tender and fully cooked. Optional-For a more blended, less chunky, lentil soup, transfer part (or all) of the soup to a large blender and process until smooth. Take extra care and do this step in smaller batches if you are pureeing while the soup is still hot. Season and serve. The final part of making curried lentil soup is always seasoning and garnishing. Typically, the only additions I need to add is a pinch or two of salt, some pepper, and perhaps a little cayenne if I feel like a little heat. Picking garnishes for soup is a somewhat personal process. Like baked potatoes, some people love a loaded soup, while others do not. In the case of this curry lentil soup, I could have gone either way. Delicious enough to enjoy without all the extras, but welcoming enough that I felt I could, literally, add it all. Additional cream– coconut cream (shown), milk creamer, sour cream. 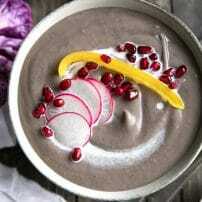 Yogurt– similar to adding a little extra cream to the top, yogurt and a curry are essentially made for each other. The mellow tang from the yogurt is a perfect balance to the bold curry spices. 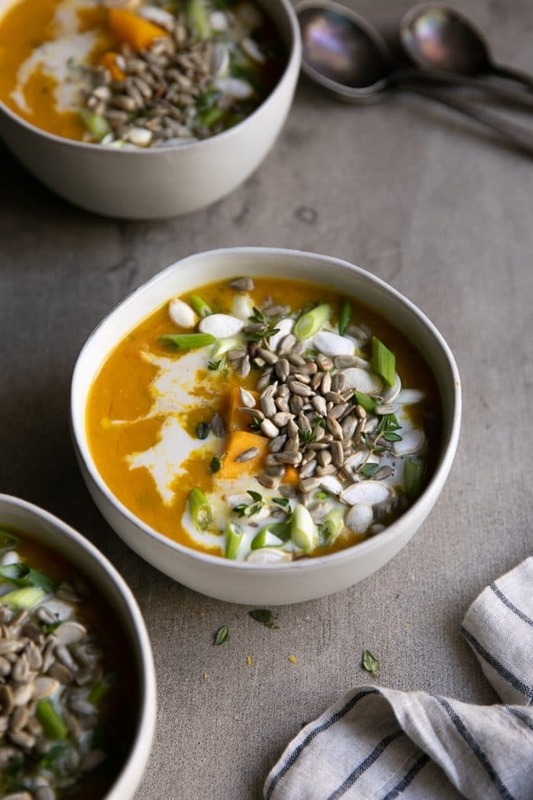 Nuts or seeds– I love a little crunch in my soup. 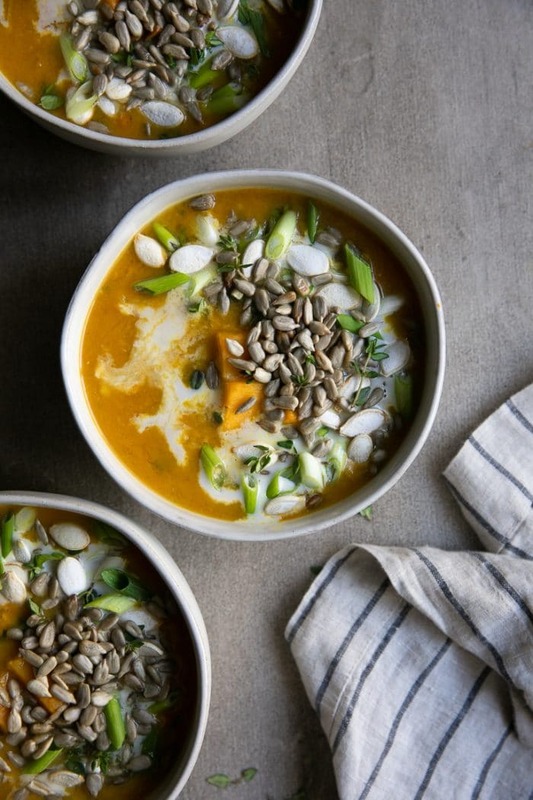 I highly recommend sunflower seeds and pumpkin seeds in this curry lentil soup. Green onion– my favorite garnish of all time, a little chopped green onion makes everything taste better. Fresh herbs– here I added some fresh thyme, although cilantro would also taste delicious. Great news! This delicious soup tastes just as good, perhaps even better, leftover the next day! This makes this curry lentil soup a perfect meal to cook up over the weekend and enjoy all week long for lunch and dinner. To store leftovers, simply transfer any remaining curried lentil soup to containers with tight-fitting lids and store in the refrigerator for up to 3-5 days. You may reheat this leftover curry lentil soup in the microwave or by transferring soup to a small pot and warming over medium heat. This curry lentil soup will thicken after cooling. Add water to the leftover soup until desired consistency is reached. Can you freeze leftover Lentil Soup? Allow soup to cool completely before transferring to a large freezer-friendly ziplock bag. Squeeze out as much air as possible and find a flat surface in the freezer for it to freeze. To thaw, allow soup to rest in the refrigerator overnight or place on the kitchen counter at room temperature for 1-2 hours before carefully removing from the plastic bag and into a small pot to reheat. If you try making this Curry Lentil Soup Recipe, please leave me a comment and let me know! 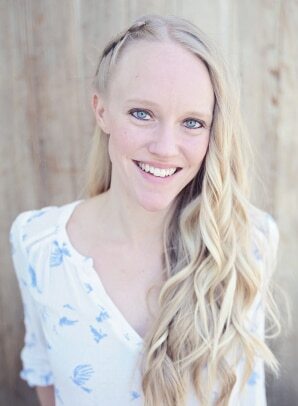 I always love to read your thoughts and feedback and would love to hear all about your favorite garnishes! DON’T FORGET TO PIN AND SHARE THIS EASY CURRY LENTIL SOUP WITH COCONUT MILK TO ENJOY AND SERVE ALL WINTER LONG. 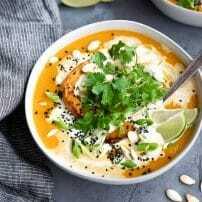 Smooth, creamy and loaded with all the flavors of spiced curry, your whole family will love this healthy and delicious Curry Lentil Soup with Coconut Milk. Cook the vegetables. Add olive oil to a large pot or Dutch oven over medium heat. Add the onion and cook for 3-4 minutes, stirring occasionally. Add the carrots and celery to the onions and continue to cook for an additional 5 minutes. Finally, add the butternut squash, garlic, and apple to the pot, mixing well to combine. Cook over medium heat, stirring often, for 5-7 minutes, or until butternut squash just starts to turn tender. Add the water. Add the water or vegetable broth to the pot. Increase heat to high and bring to a low boil. Cover and reduce heat to low. Simmer for 5 minutes. Add the pumpkin puree, spices, and lentils. Stir in the pumpkin puree, spices, and lentils, mixing well to thoroughly combine. Return liquid to a simmer before reducing heat to low and covering with a tight-fitting lid. Simmer for approximately 60 minutes, stirring every 5-10 minutes. Add Coconut Milk. After 45-60 minutes, stir in the coconut milk and continue to simmer, covered and over low heat, until lentils are tender and fully cooked. Optional. For a more blended, less chunky, lentil soup, transfer part (or all) of the soup to a large blender and process until smooth. Take extra care and do this step in smaller batches if you are pureeing while the soup is still hot. Season and serve. Season the soup to taste with additional salt, pepper, and curry seasoning if desired. Garnish each bowl with coconut cream, green onions, and sunflower seeds. Enjoy! For a more blended, less chunky, lentil soup, transfer part (or all) of the soup to a large blender and process until smooth. Take extra care and do this step in smaller batches if you are pureeing while the soup is still hot. This was great! Everyone loved it. With a fruit based salad and a home made sourdough roll it was the perfect thing for a cold night. The depth of flavor is superb. It made more than 6 servings for us but that’s great because now there are a few more meals in the freezer. Thanks for the recipe.